One of the double-sworded attributes of the digital era is the ease in reproduction of art. The reproduction of an image in order to publicize it to mass media for communication purposes or in order to add to the overall message of the work are two examples of the good side of the sword. The bad side, the one the stabs you, is that the reproduction of an image can diminish the aura of the original. 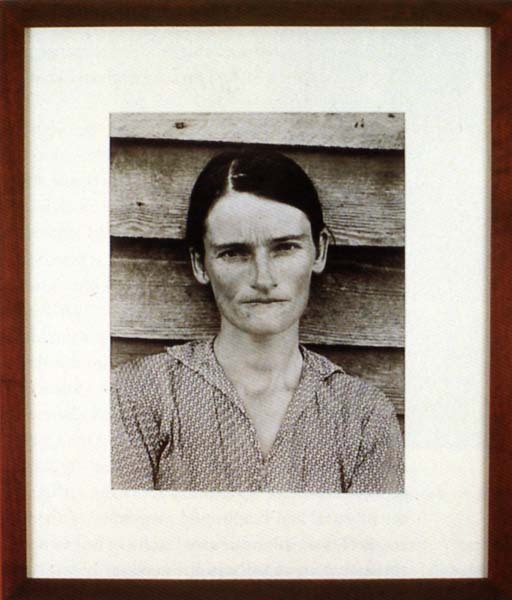 "In 1936, Walker Evans photographed the Burroughs, a family of sharecroppers in Depression era Alabama. In 1979, in Sherrie Levine rephotographed Walker Evans' photographs from the exhibition catalog First and Last. 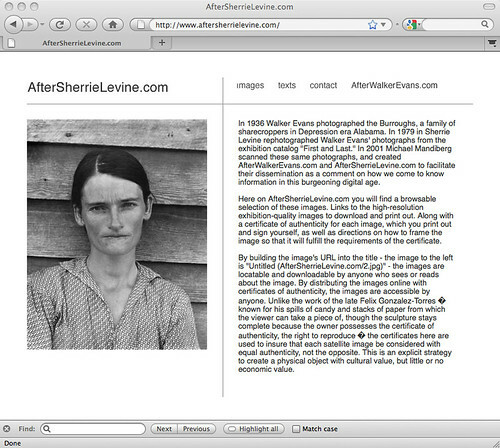 In 2001, Michael Mandiberg scanned these same photographs, and created AfterWalkerEvans.com and AfterSherrieLevine.com to facilitate their dissemination as a comment on how we come to know information in this burgeoning digital age." Though Sherrie Levine 's photographs of Walker Evans' and Mandierg's scans of the photographs were not originals, they are still all the same images just with loss of the aura of the original, for some viewers. This work is still continually up for debate as whether it is the good side or bad side of the sword. The fact that it can be viewed and even downloaded and then printed out as an original Mandiberg photograph is the good side of the sword. The bad side however, is that the photograph of Ms.Burroughs was not originally taken and created in the mind of Mandiberg, that aspect will always belong to Walker Evans. Good work. Try to avoid too much copy/pasting or too much of the entry being a direct quote.